Ten playful puppies want to talk about opposites! Young dog lovers get to know cuddly puppies by name in this cutely photographed concept book about opposites. Max the Boston terrier and his friends show the difference between near and far, awake and asleep, dry and wet, and more. Funny puppy commentary adds to the canine chaos. J. C. Coates is a professional photographer known for her simple and timeless aesthetic and her passion for photographing pets. She met most of these puppies while walking in Central Park with her beloved Tibetan terrier, Scout. Puppy Talk is her first book for children. Playful puppies with big personalities illustrate pairs of opposites. 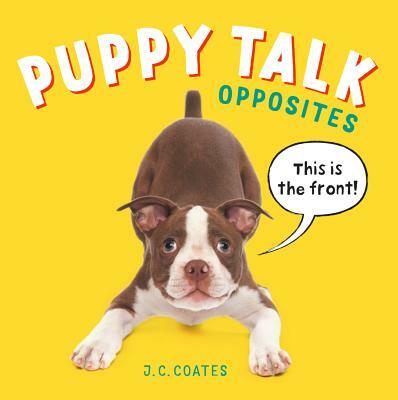 Professional photographer and author Coates presents a cast of cuddly, exuberant puppies who model a variety of useful pairs of opposite terms. "Front" and "back," "far" and "near," "awake" and "asleep," and six other pairs of vocabulary words come to life in these charming and funny photos. Amusing comments from the four-legged models add an element of laughter and a hint of chaos, as well. A tiny picture of a Boston terrier, set back in the upper-left corner on an otherwise white page, accompanies the text "Max is far," as Max calls out from the distance, "Hello-o-o!" On the facing page, "Max is near," and a close-up of the dog's face fills the page; Max says, in alarm, "Whoa! TOO close!" Sophie, an adorable Portuguese water dog, is "dry" on one page, remarking, "I need a bath." The facing page reads, "Sophie is wet," and the damp and annoyed-looking pup is wrapped in a towel, saying, "I need a hug." All the dogs are photographed in color and presented on a plain white background, which makes the ideas presented in each photo impossible to miss. Featured vocabulary is printed in colored type. The front and back covers also feature Max, face-first or backside-first respectively, announcing "This is the front!" and "This is the back!" Silly and instructive; an animal lover's delight.